The officer will take the information from you needed to file a police report. The Officer will do as much follow-up as possible during his/her tour of duty, depending on the level of calls for service. During his/her shift, the officer will enter all of the information gathered on your incident in the Department computer system. The computer assigns an incident number, which identifies your case. Each morning the Captain reviews the incidents from the previous shifts to determine what reports will need to be followed-up by the Investigation Division. Not all cases are investigated by detectives. The majority of crimes can and will be investigated by the original officer. The detectives will investigate the more serious offenses, i.e., homicide, suicides, major burglaries and breaking and entering, but not all cases require a detective for the investigation. The detectives are a resource to the investigating patrol officer, and your primary contact in most crimes will be the original responding officer. If there is a workable suspect, information or clues left behind by the suspect, the officer(s) will attempt to work your case. If there are no suspects or clues, the case will be filed as an open case. Usually you will not hear from an officer unless new evidence develops. If you or your insurance company needs a copy of the police report, it can be obtained from the Police Department free of charge. Most reports are available within 24 hours. However, it is best to call (252) 332-5011 to see if your report is available before coming to the police department. Wecome to the APD’s News and Information Page! 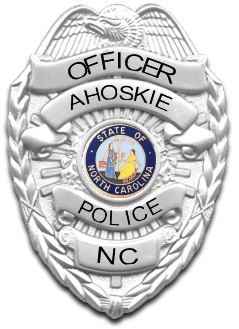 Wordpress Law Theme © 2019 Ahoskie Police Department. All rights Reserved.